Most of the time, people wonder if you can use a grill as a smoker, but what if you had the ability to grill on your smoker instead? With the ability to create a dual-purpose appliance, you’ll surely be able to make the most out of your meats and vegetables during warm weather. Above all else, being able to answer, “Can you grill on a smoker?,” gives you the ability to use a single tool instead of having to buy both a grill and a smoker separately. With the help of this guide, you’ll be able to learn how to create an all-in-one cooking device that is simple to use. How to Create an All-in-One Cooking Device? The first thing you’re going to need to do is to make sure that you’re getting your hands on the right equipment. Otherwise, you’ll be stuck in a position to where you can either grill or smoke rather than do both. It’s quite easy to convert a traditional grill into a smoker, but turning a smoker into a grill is slightly tougher. If you don’t already have an existing grill, it’s recommended that you consider looking into an offset smoker. 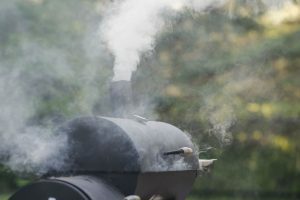 With the help of an offset smoker, you can decide whether you’d like to smoke or grill your meat, as there is a separate chamber (known as a firebox) to the right of the main compartment where you’d add your smoking materials. 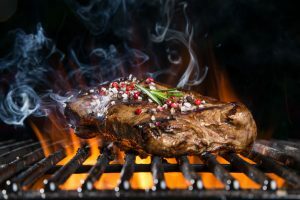 In the event that you’d prefer to grill, you’re going to need to have access to the firebox to add in your charcoal, logs, and grilling grate so the meat you are cooking will be as close as possible to the heat source, cutting back on your cooking time and helping you to achieve the perfect sear. Offset smokers are quite popular because they offer the best of both worlds. However, if you already own a smoker and are interested in converting it to a grill, proceed to the next step. When you’re getting your smoker ready to grill, you’re going to need to prepare enough charcoal to fit approximately half of the bottom chamber. If you were to take a look at the distance between the bottom of the smoker and the grilling grate, you’d notice that there’s a significant amount of space, which means the grate is likely to not get warm enough for searing meat. Not only are you going to need to use more charcoal than you would if you were smoking, but you’re also going to need to make sure that the charcoal gets extremely hot. That is necessary not only for the next step but also to ensure that your food will get hot enough to cook in as little time as possible. Now that you have a sufficient amount of searing hot charcoal, it’s time to add your choice of wood. Depending on the type of meat your cooking, you may prefer one type of wood over another. 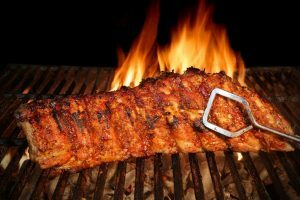 Mesquite is a great choice for grilling meats and vegetables, and it’s one of the most readily available types of wood. We’d recommend grabbing three to four small logs of wood and you can place them directly on top of the hot charcoals. 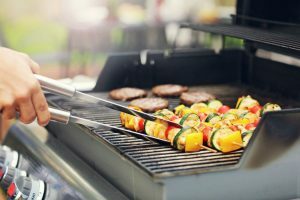 Before closing the lid, place the grilling grate back in its appropriate position and grab a thermometer that can attach itself to the grate, as you’re going to need to monitor its temperature to make sure it’s at the ideal heat for grilling. At this point, you may notice that the logs are beginning to catch fire which is exactly what you want for the highest production of heat. You can close the lid to your smoker and allow the logs to burn down until they are basically embers. At this point, the thermometer should be reading around 500 degrees Fahrenheit, and you can proceed to the next step. Now that the smoker is at the ideal temperature for grilling, you’re going to want to prepare your meat and/or vegetables with the help of a dry rub or basic seasoning, whichever you prefer, and place the meat directly onto the grate. 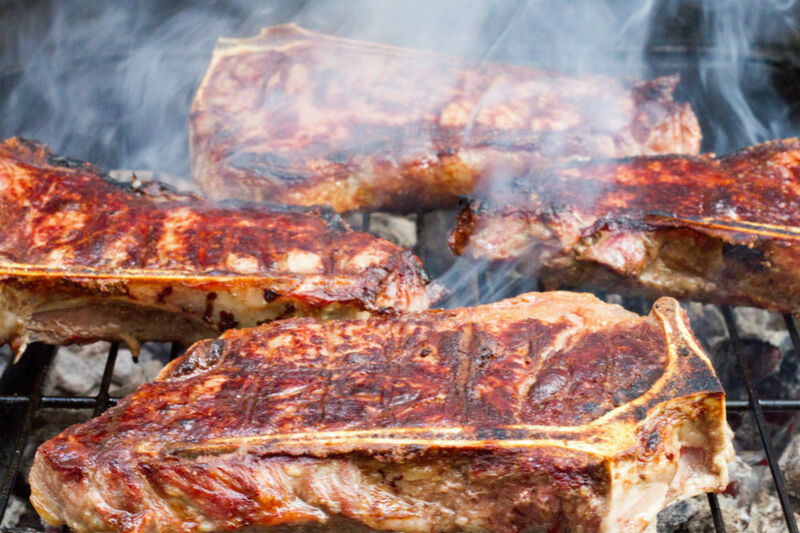 To allow for the best airflow for grilling, make sure that you leave the exhaust chamber of the smoker slightly open so that the fire doesn’t get choked out, and the meat will still get the succulent smoked flavor once it’s finished cooking. 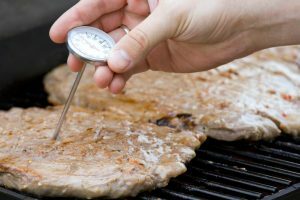 Depending on how you like the meat and the type of meat you are grilling, pay close attention to the internal temperature to ensure that it does not overcook. With this method of grilling by using your smoker, you should have a fully ready meal within 30 minutes. It’s also important to make sure that you give the meat enough time to sear on one side before deciding to turn it onto the other side. 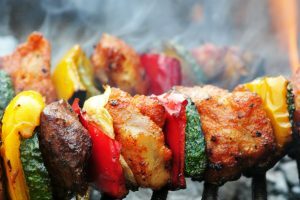 As you’ll be working off of the heat of the coals with this method, you will need to wait for the grate to reach its maximum temperature once the room-temperature meat is put on the grill. Otherwise, you’ll find that the meat will stick to the grate and tear apart. This is particularly important if you’re grilling burgers on your smoker. 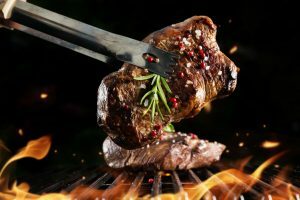 Once you’ve achieved the ideal cook for your meat, it’s now time to remove the meat from the grill and allow it to have time to rest before serving. Ensure that you clean the grilling grate of your smoker similar to how you would with a traditional grill. 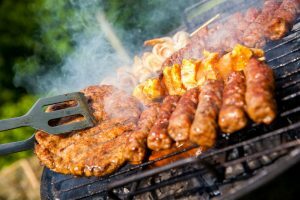 Otherwise, you’ll experience build-up up of dangerous chemicals the next time you decide to use your smoker as a grill. Can You Grill on a Smoker? Absolutely! The things that you can do with multi-purpose appliances is amazing, especially when it comes to repurposing your smoker into a grill. If you’ve ever wondered and asked, “Can you grill on a smoker?”, the answer is yes, and with ease! 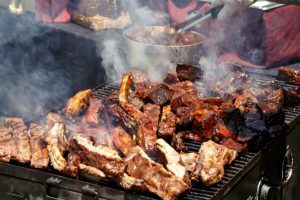 There are also plenty of different ways to transform your regular grill into a smoker with a few simple steps, giving you the ability to make the most out of the equipment that you already have in your home.